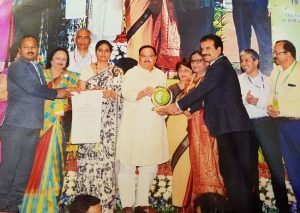 Bhopal, April 21, 2018 (Ataullah Faizan): Union Minister for Public Health and Family Welfare, Mr. J.P. Nadda gave the first prize in the national programme of Kayakalp Award organized at Ram Manohar Lohia Hospital in Delhi today, to Bhind district hospital of Madhya Pradesh, second prize to Satna and first prize in community health centre category to Rani Durgavati Civil Hospital of Jabalpur. The consolation prize of Rs 50 lakhs was given to AIIMS hospital of Bhopal. First national level prize of Rs 2.50 crore was given to AIIMS, New Delhi while the second prize of Rs 2.5 crore was given to Chandigarh PGI. Union Minister of State for Public Health and Family Welfare Mrs. Anupriya Patel was also present. Director of National Health Mission Mr. Vishwanathan and a team of various hospitals accepted the award on behalf of the state. Secretary Health Mrs. Preeti Sudan and Mr. Manoj Jhalani were also present on the occasion. Mr. Nadda said that the hospitals of the country have improved with the Kayakalp campaign. Warning the hospitals with less than 70 percent points, he said that information on the review of works undertaken by each hospital in the end of the year will be updated on the portal. Software is being developed which will have information on the patient’s admission, treatment, death, recovery period and whether the patient is satisfied with the treatment or not. He said that this year hospitals will be surveyed this year by “My Hospital” app.